Alastair Seeley will ride the PBM Be Wiser Ducati V4 R at the North West 200. 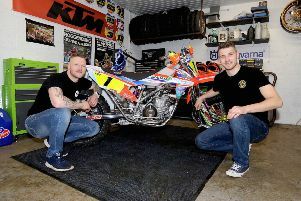 The 39-year-old will ride for Paul Bird’s team in the Superbike races at the North West 200 in May as Seeley bids for more success around the 8.9-mile Triangle course. Despite limited time on the all-new Italian machine, Seeley finished 16th fastest on the combined time sheets at Portimao after completing over 50 laps, with his best time 2.3 seconds back on overall pacesetter Jason O’Halloran (McAMS Yamaha). PBM’s Scott Redding was second quickest, 0.127s behind O’Halloran, while Aussie Josh Brookes was fifth fastest on the Panigale V4 R.
Seeley is competing in the British Supersport Championship this season on the EHA Racing Yamaha, which he will also ride at the North West after winning both races in 2018. Johnny Mowatt, PBM Be Wiser Team Co-ordinator, said: “Testing has gone really well with all of our riders finding their feet with the new Be Wiser Ducati V4R. Ballinmallard’s Josh Elliott was on the pace as he posted the sixth fastest time on the OMG Suzuki, while Carrick man Glenn Irwin was eighth on the Quattro Plant JG Speedfit Kawasaki, narrowly ahead of his brother Andrew in ninth (Honda Racing). A final BSB test will be held at Silverstone on April 9 ahead of the opening round of the championship at the same venue over the Easter weekend.